The Springs Ranch is a truly unique and idyllic Hill Country retreat and working exotics ranch for sale in Gillespie County, between Llano and Fredericksburg, Texas. These breathtaking 282 acres range from spring-fed live water and ponds in a central valley lined, to exposed granite outcrops rising 100 feet above the valley floor. These impressive pink granite features are Town Mountain Granite, part of the same igneous batholith as Enchanted Rock just five miles away. The highest elevations of the ranch, some 250 feet above the creek that traverses the valley, offer dramatic, panoramic views for miles of stunning Hill Country terrain. The Springs Ranch is accessed from paved Highway 16, between Llano and Fredericksburg. The ranch is under 20 minutes from historic downtown Fredericksburg and just an hour and a half from Austin. 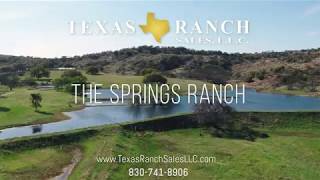 Water is abundant on The Springs Ranch with 12 ponds ranging in size from one-half acre to five acres. The water features are fed both by crystal clear springs and seasonal rain runoff. The largest lake has reportedly held water continuously since it was built in the 1960s. The springs and runoff form the headwaters of Legion Creek which runs for a mile through the central valley of the ranch for eight to ten months of the year. There are two electric water wells on the property and a rainwater collection system with a 25,000-gallon storage tank and water treatment facility. The Springs Ranch is a working exotics ranch stocked with Axis and Blackbuck. It is completely high fenced into four primary pastures with a trap for working the exotics. Water is available for the animals in all four pastures. Three-quarters of the ranch is native brush and hardwoods, with the remaining quarter as pasture. The land has been well cared for with ongoing predator control, as well as cactus, cedar, and mesquite control. There are three hunting blinds, and four corn and protein feeders placed across the property. The vast majority of the roads on the ranch are chip seal paved with native pink granite. The two main homes, built in 2011, are nestled in the western head of the valley, below the pink granite cliffs, but overlooking several of the ponds. Both homes are 1,800 square feet with three bedrooms and two full baths, with covered front porches extending the length of the homes that offer pastoral views of the valley and ponds. These homes are furnished with electricity from a 31 kWh solar PV system that is connected to the grid. Four separate meters supply electricity to the rest of the ranch. Another 2,400 square foot home sits among trees on the northern portion of the ranch. Other improvements include a 2,000 square foot insulated, metal barn with a concrete floor built in 2015, and an older 450 square foot wood barn with a metal roof. Ranch equipment and furnishings will convey with the sale. This spectacular example of a one-of-a-kind Texas Hill Country exotics hunting ranch is something that must truly be experienced to fully appreciate its dramatic natural beauty in water and stone.